Learn how to protect and defend the vital information networks of public and private organizations! Why Information Assurance at Bay Path University? Protecting a company’s most powerful asset, its information, is a complex job. Information assurance specialists ensure the integrity, confidentiality, and availability of information. They design, develop, implement, operate, and troubleshoot information security systems to safeguard a company’s information. Information assurance specialists manage the risks associated with information transmission, processing, and storage. Click here for a heat map of cyber jobs. 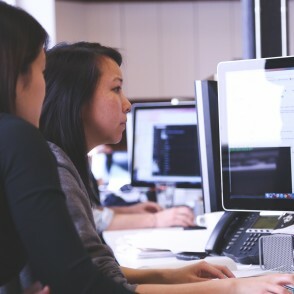 Common jobs with a BS degree in Cybersecurity and Information Assurance (IA) include information security analyst, application security specialist, computer security specialist, and data security analyst. Potential workplaces include: bank or financial firm, global technology company, government, higher education, or information technology consulting firm. Students in this specialization will have access to state-of-the-art technology. Students in this program will experience practical, hands-on learning designed around best practices in a safe, interactive virtual lab environment. This virtual platform allows students to develop skills by practicing with tools used in the industry through Bay Path’s secure virtual lab environment. Prepare to earn in-demand certifications while earning your degree. We'll give you the skills and knowledge you need to take the certification exam. Bay Path University is now collaborating with Google to offer computer science, data science, and machine learning courses to its undergraduate students. We offer seamless pathways to 1- and 2-year graduate degree programs, such as Bay Path’s MS in Cybersecurity Management, MS in Applied Data Science, and many more. The I-Team also spoke to Matthew Smith, the Director of Computer Science and Cybersecurity at Bay Path University about the issue. Scholarships to inspire women to join the ever-growing field of Cybersecurity.